Sir Philip Dowson CBE PRA RIBA (1947), born 16 August 1924 was one of Britain’s most important architects of the 20th Century. Educated at Gresham's School, Norfolk, he spent a year reading mathematics at University College, Oxford, before joining the Royal Navy during the Second World War and serving in both the Atlantic and Pacific theatres. He returned to study Art History at Clare from 1947 to 1950, and then trained at the Architectural Association. 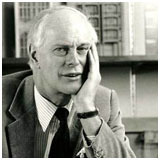 He joined the engineering firm Ove Arup and Partners in 1953 as an architect and in 1963, with Ove Arup, Ronald Hobbs and Derek Sugden, became a founding partner and later chief architect of Arup Associates. Composed of an innovative and collaborative team of influential architects, engineers and quantity surveyors, Arup Associates' approach to design was rational, scientific, and based on a belief that the function of a building, the nature of the materials used and the necessary methods of construction should form the basis of design. Philip left a lasting legacy to Clare by designing the Forbes Mellon Library, which stands in the centre of Memorial Court. It is a design which has been highly praised for the sympathy in which it blends with the original court by Giles Gilbert Scott, and its popularity as a place of study is evidenced by the number of students who frequent it. Among numerous awards and honours, Sir Philip Dowson was made a CBE in 1969, and received a Knighthood in 1980. He was elected to the Royal Academy of Arts in 1979 and two years later was awarded the Royal Gold Medal for Architecture. He was President of the Royal Academy of Arts from 1993 to 1999.